By The Star on 2 Nov 2018, PETALING JAYA: Malaysian Cabinet has released the country's new budget on 2 November 2018. By The Edge Markets on 9 Oct 2018, KUALA LUMPUR: The Malaysian Institute of Accountants (MIA) is in talks with the Ministry of Finance (MoF) to amend the Accountants Act 1967, which empowers the accounting body as the regulator and developer of the accountancy profession. "We have asked for stronger sanctions and investigative powers in order to better enforce regulations and good governance in a more complex business environment," MIA president Salihin Abang said in his keynote address at the MIA International Accountants Conference 2018 today. "In 2018, we have already disposed of our backlog of cases and taken stern action against bogus accountants, and our consistent and just enforcement, backed by balanced education for members and all those offering accounting services in Malaysia will continue in the future," he said. We have attended the MIA Annual Conference 2018 on 9 - 10 October 2018 and bringing more knowledge back to serve you! This year, MIA is focusing on "Riding the Digital Wave" and encouraged fellow members to transform themselves into a more value-added service providers rather than being a traditional financial reports preparers as these jobs will soon be replaced by Artificial Intelligence (AI) and all other technologies. By News Straits Times on 27 Sept 2018, KUALA LUMPUR: Beginning November, it will be mandatory for companies to submit their annual statements, unaudited financial statements and Certificate for Exempt Private Company (EPC) to the Companies Commission of Malaysia (SSM) using the Malaysian Business Reporting System (MBRS) platform. In the first phase, starting November, it will be mandatory for companies in Kuala Lumpur and Selangor to submit via the MBRS platform. The second phase will involve companies from the other states; Negri Sembilan, Melaka and Johor from December, followed by Pahang, Kelantan and Terengganu in January. For Perlis, Perak, Kedah and Penang, it will be from February, and Sabah, Sarawak and Labuan in March. 28 Sept 2018 - Our firm's Partner, Jackie has presented the new idea of transforming our services into more digitalised services to the audience and passed down the knowledge of choosing the right financial advisor to them during the presentation. Be printed with the header "Invoice"
Exclude canteen in an educational institution or operated by a religious institution or body. 28. Betting and gaming provider involving bettings, sweepstakes, lotteries, gaming machines or games of chance. Betting and gaming services involving bettings, sweepstakes, lotteries, gaming machines or games of chance. Conducting tournaments involving bettings, sweepstakes, lotteries, gaming machines or games of chance. Conducting or allowing the conduct of a card game or any other game by the casino operator. IT services in connection with goods or land outside Malaysia or where the subject matter relates to a country outside Malaysia. You may now check to the latest list of sales tax rates for various goods at the official mysst site at https://mysst.customs.gov.my/assets/document/Guide%20On%20Proposed%20Sales%20Tax%20Rates%20%20for%20Various%20Goods%20Version%202.0.pdf. 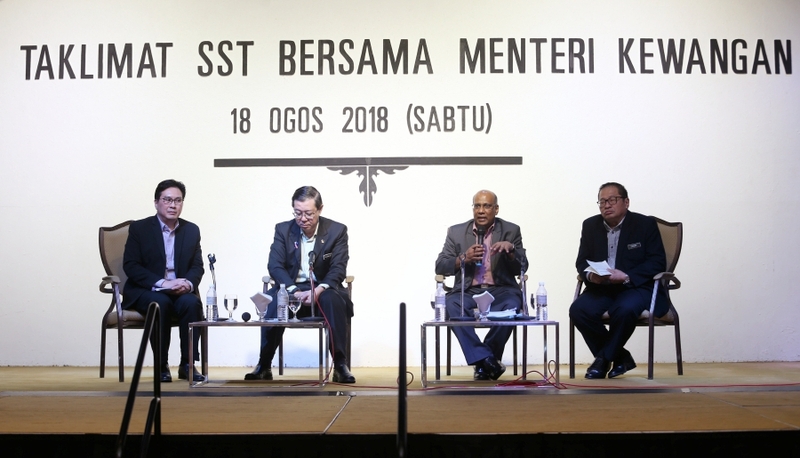 By New Straits Time on 18 August 2018, SUBANG JAYA: Finance Minister Lim Guan Eng said the government will use a 'soft-approach' with traders and businesses in implementing the Sales and Services Tax (SST). He hoped that retailers and businesses would declare their taxes honestly. However, he said those who are unsure should refer to the Custom Department on their eligibility. By The Star on 17 August 2018, TWO companies from China have proposed to invest US$10bil (RM41bil) in Malaysia’s third national car project and build a regional automobile hub to cater for the region in southern Perak, according to official sources. Separately, Zhejiang Geely Holding Group has shown interest to participate in the national car project by upgrading its facilities in Malaysia. The third national car project was mooted by Tun Dr Mahathir Mohamad after he became Prime Minister for the second time on May 10. By The Star on 17 August 2018, PETALING JAYA: The re-introduced sales and services tax (SST) may likely increase the cost of doing business for several industries in Malaysia post-Sept 1, according to KPMG executive director for indirect tax practice Ng Sue Lynn. Speaking to StarBiz after The Star’s empowerment talk on “Transitioning to SST”, she pointed out that the SST will be an additional cost for businesses in several sectors that are not exempted under the indirect tax regime. “In comparison, the goods and services tax (GST) is a cost for the end consumers, rather than the businesses. By New Straits Time on 15 August 2018, KUALA LUMPUR: The Employees Provident Fund (EPF) announced that the registration for Caruman Sukarela Insentif Suri (i-Suri) opens today, and those who are eligible may participate in i-Suri by registering as an EPF member at any of the 67 EPF branches nationwide. Housewives, widows and single mothers whose profiles are enlisted in the National Database on Poverty (eKasih), can register for i-Suri and contribute a minimum of RM5 on a monthly basis into their retirement savings accounts, in order to be eligible to receive the Government incentive of RM40 per month, which will be deposited into their EPF accounts. By The Star on 9 August 2018, KUALA LUMPUR: The Employees Provident Fund (EPF) and ride-hailing service provider, Grab Malaysia, signed a memorandum of understanding (MoU) to encourage the ride-hailing driver-partners community to participate in EPF's voluntary retirement savings programme, Caruman Sukarela Insentif Persaraan (i-Saraan). EPF chief executive officer Datuk Shahril Ridza Ridzuan said members of the ride-hailing community participating in the programme would be provided with a secure savings option as the EPF has a proven track record of sustainable, above-inflation returns which will enhance the value of their savings over the long-term. By The Star on 12 August 2018, MALAYSIA’s decision to revert to the Sales and Service Tax (SST) from the Goods and Services Tax (GST) will result in a higher disposable income due to relatively lower prices it will incur in most goods and services. Consumers will have a choice in their consumption – by paying service taxes based on their affordability and ability. The coverage of GST was comprehensive and it covered too wide a sector. By The Star on 29 June 2018, KUALA LUMPUR: The Employees Provident Fund (EPF) has scrapped the RM50 minimum ruling for members who voluntarily contribute to their accounts with effect from July 1, 2018. While they can contribute any amount to the retirement savings fund, the accumulated maximum amount to be contributed into each account, however, remains capped at RM60,000 per annum. The voluntarily contribution to the EPF accounts is either through the 1Malaysia Retirement Scheme (SP1M), self-contribution or the top-up savings contribution. By the Sundaily on 29 June 2018, KUALA LUMPUR: Human Resource Minister M. Kulasegaran has approved the extension of social security protection to the spouse termed 'employee' in a husband-wife business. Amendments to the Employees' Social Security Act 1969 (Act 4) and Employment Insurance System Act (Act 800) have been recorded in the Government Gazette and will go into effect on July 1, 2018, a statement from the Social Security Organisation (Socso) said. From this date, failure of an employer (who is either the husband or wife) to register and contribute to Socso as stipulated by the Acts, will result in imprisonment of up to two years, a fine not exceeding RM10,000 or both if convicted.